Folkestone Lightbulb stands over the junction of two of the most important streets in Folkestone’s old town, Tontine Street and The Old High Street, at the gateway to the Creative Quarter. 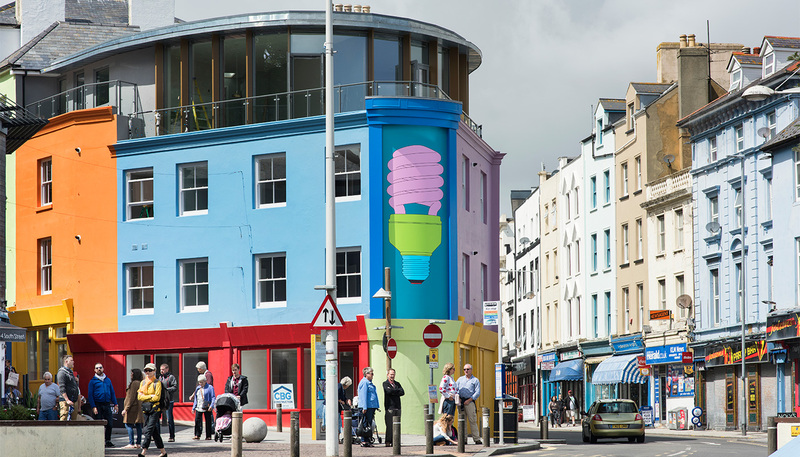 The image is composed of Craig-Martin’s trademark strong stylish colours and formally picks up on the curving façade and spiralling architecture of the building on which it is placed, while conceptually the lightbulb suggests ideas, (sustainable) energy, that moment of inspiration, expressing the essence of the regeneration that is happening around it. Michael Craig-Martin is best known for his work An Oak Tree 1973, in which he claimed to have changed a glass of water into an oak tree; for his large-scale black and white wall drawings; and for his intensely coloured paintings, installations, and commissions.